A tool to find ANY assigned numbers in Lync – L.U.R.I.A. Find any number assigned in Lync. Of course there are numerous powershell scripts that will collect this information for you. This however is an application without the need for running Powershell or Logging in to the Lync servers (provided the core components are installed on the PC the tool is run from). Its a good way to extend basic searhing of name and number assignments without the need to run poweshell scripts manually, or collect information from a saved output file. 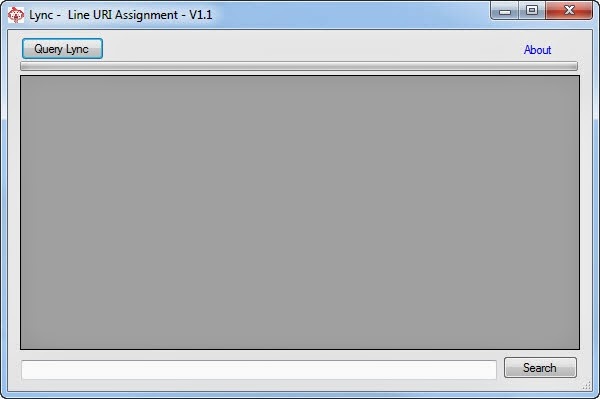 Simply launch LURIA.exe (Lync – Line URI Assignment). Click on Query Lync to populate the data display window (Lync Core Components required for this). Install the Lync core components of the PC that the tool will be run from. We like to nominate a Tool Server to run this on, also other items such as SEFAUtil. The usual Lync RBAC permissions are required. Andrew Morpeth who provided his Lync Get All Assigned Numbers Script which forms the basis of this tool. Wow, I only just posted the post and was still adding the download link. Anyway its there now. Please be sure to either run the tool from the Lync Front End or install the Lync Core components on the PC that LURIA will be run from. Be sure to provide me with feedback as I am still debugging. works great in my lab environment (Lync 2013 STD). I think adding SipAddress column and Description column would also help, because in case such as CsExUMContact, you can't tell what is the object except of it's GUID. I have added a SIPAddress column in V1.1, I don't want it to become too convoluted so will need to think about the briefest of descriptions prior to adding that.